Joseph ROBINSON (father), Claremont, Timaru. After father's death, next-of-kin was brother Joseph. Height 6 feet 3 inches. Weight 218 lbs. Chest measurement 41-44 inches. Complexion fair. Eyes grey. Hair brown. Sight, hearing and colour vision all good. Limbs and chest well formed. Full movement of joints. Heart and lungs normal. Teeth good. Free from hernia, varicocele, varicose veins, haemorrhoids, inveterate or contagious skin disease. Good bodily and mental health. No slight defects. James Edward ROBINSON was the eldest son and eldest of the eight surviving children of Joseph and Margaret (nee SINCLAIR) ROBINSON, of Claremont. He was educated at Gleniti and Claremont schools. In Standard II in 1896 at Claremont, he was the recipient of a prize - "good sound useful books". In December 1912 he was best man at his sister Sarah's wedding. James was declared bankrupt in March 1915, after he had left for Trentham. His father and brother Frederick were to carry on his business; some payments had been made to creditors and assets (plant, sheep, horses) found to be sold. James took a leading part in social functions in the Claremont district, among these being treasurer for the Bachelors' Ball in 1914, and was of a most congenial disposition. 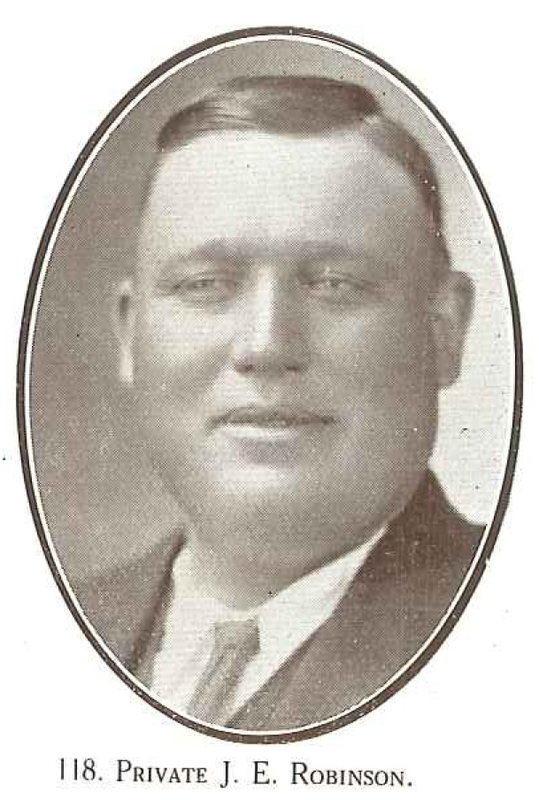 He, in turn, was well liked in the Claremont district and much mourned by his siblings who inserted a passionate memorial notice in the Timaru Herald in 1916. After leavig school he worked on his father's fam and before enlistment he was a farmer and road contractor on his own account, an occupation which he loved. James was killed in action less than four months after embarking. His medals, plaque and scroll were sent to his brother, Mr J. ROBINSON, of Claremont, Timaru. This brother Joseph was advised that, both parents being deceased (father died in 1916 and mother in 1915) and no one in receipt of a pensio, he was not entitled to receive any gratuity in the estate of James. When his father's estate was being administered in 1917, a voucher for 9 pounds 10 shillings and 8 pence was paid to the Public Trustee from James's estate. James was a big, well-built man, in good physical shape - 5 feet 3 inches tall and weighing 17 stone, but this was of no avail in the battle field. His brother Joseph ROBINSON served in WWI and gave an item at James's farewell function. . .